Difficult? I think it is easy to easy that the black rook has to hide and only the place to hide is moving left. Perhaps not very difficult, but still nice. The key is a tempo-move, 2nd and 3rd open the lines. Thanks Nikola. I noted that for the setplay 1….Rf8 2.e8B! to work black pawn on g3 is needed. Without it, black refuted 2….Rg8! I have asked Julia to correct the diagram. The diagram is updated as you’ve asked! I’m not sure that I understand. 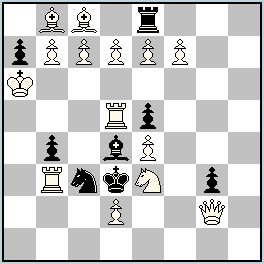 After 1…Rg8/h8 white can play shortly 2.Qe2+ Kxe4 3.Ra5. The same is after 1…Rf8 2.e8B! Rg8/h8 3.Qe2 etc.. Why bPg3? Thanks Nikola. I missed this !